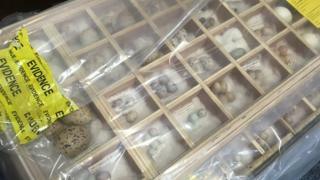 A man who illegally collected more than 5,000 rare bird eggs has been warned he faces jail. Daniel Lingham, 65, was spotted "head-to-toe in camouflage gear" picking eggs up off the ground at Cawston Heath in Norfolk in May. Norwich Magistrates' Court heard he was searched by police, who then visited his home and found thousands of eggs. Lingham, of Newton St Faith, Norfolk, admitted five offences under the Wildlife and Countryside Act 1981. Officers found a total of 5,266 eggs of species including nightingales, nightjars, turtle doves, chiffchaffs, little-ringed plovers, woodlarks and kingfishers at his home. Colette Harper, prosecuting, said police searched Lingham after he was reported by a member of the public on 21 May. He told them: "I've been a silly man, haven't I?" They searched his home and found tubs containing eggs under his bed and in the kitchen and living room. Lingham was convicted of similar offences in 2005 when he was jailed for 12 weeks for illegally collecting 3,603 eggs, the court heard. He pleaded guilty on Friday to taking nine linnet eggs at Cawston Heath, having 75 wild bird eggs from species which are in decline, and possessing 4,070 ordinarily protected wild bird eggs. He also admitted two counts of possession of articles capable of being used to commit an offence - items found during the search, and boxes and bird reference books found at his home. Lingham told magistrates: "I didn't realise how many eggs there were. I didn't count them." James Burrows, mitigating, said Lingham had been referred to a mental health team and was being treated for obsessive compulsive disorder. Chairman of the bench Jeanne Heal bailed him until 27 November and said: "We're looking at a quite lengthy custodial sentence." Speaking outside court, RSPB senior investigations officer Mark Thomas described Lingham as a "one-man crime wave in terms of rare birds in Norfolk" whose actions had an "incredible impact on birds both regionally and nationally". Mr Thomas said egg collecting was now "really rare" after a change in the law in 2001 meant egg collectors could be jailed. The seizure of eggs was the largest since Lingham was last convicted in 2005, he added.